The Maverick MK2 Wash is now available, and it promises to open new ways for designers to incorporate LED washes into tours, theatrical productions and other applications. 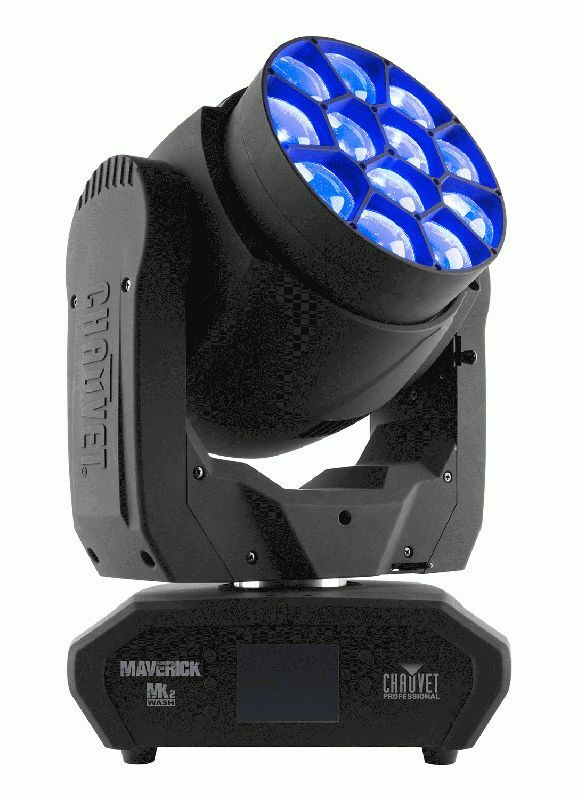 Part of the CHAUVET Professional Maverick series, the fixture is powered by 12 OSRAM 40-watt RGBW LEDs and features a custom designed optical system, along with full spectrum color mixing, to offer an impressive combination of performance capabilities. Brightness and speed are only two of the attributes that distinguish the Maverick MK2 Wash. The fixture’s broad zoom angle of 7°-49° gives it the flexibility to create beam effects as easily as it covers wide areas as a wash. Adding to the flexibility of this compact fixture is its wide array of control options. The Maverick MK2 Wash can be controlled via DMX, WDMX, Art-Net, sACN, and Kling-Net. For even greater versatility (and unlimited creative possibilities), the MK2 Wash has a Dual Protocol Mode. This feature allows the fixture’s movement and pixels to be controlled by different protocols. Using this feature, designers will find it easy to pixel map their entire Maverick MK2 Wash rig, rather than limiting themselves to specific units. Built-in macros can also be used to create pixel effects. Any look created with the Maverick MK2 Wash is certain to be vividly and richly colored. In addition to its custom dichroic full color spectrum mixing capabilities, the fixture has built-in CTO color correction, an array of built-in colors, and 16-bit dimming of master dimmer as well as individual colors for smooth control of fades. The Maverick MK2 Wash also opens new possibilities for designers to create captivating atmospheric effects, thanks in part to its virtual gobo wheel with background colors. Designers will also appreciate the fixture’s quiet operation, which makes it ideal for broadcast use and other applications where noise is an issue.